Citroen C4 Picasso range revamped | What Car? Citroen's C4 and Grand C4 Picasso models will get upgraded styling, equipment and engines from October. The revamped models, which will be on display at the Paris motor show later this week, will both get Citroen's new efficient e-HDi engine the first time they've been made available in the UK. The C4 Picasso range gets Citroen's new chevron design on the front grille and tailgate, a new front bumper, new headlights and rear light clusters. VTR+ models also get a front LED light design. The VTR+ models will also add chrome side window sills and a chrome rear bumper strip. The C4 Picasso's look can be further enhanced by a new and unique 'Black Top' option. Available in conjunction with six body colours, the roof and front pillars are painted in a glossy Onyx black finish. The door mirrors, alloy wheel centre caps also get the same treatment. 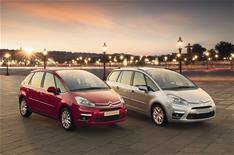 The revamped C4 Picasso and Grand C4 Picasso also get an improved roster of standard equipment. All VTR+ models will now get rear parking sensors, electrically folding mirrors, USB socket and Bluetooth. Exclusive trim will now add 17-inch alloys, new upholstery, Bluetooth and Citroen's new eTouch Emergency & Assistance system, which can automatically call for emergency assistance in the event of an accident, or if the car is immobilised. The new e-HDi engine combines Citroen's new stop-start system with various other green technologies, such as brake-energy regeneration, to improve economy and slash emissions. This delivers an average of 58.9mpg for the C4 Picasso and 57.6mpg for the Grand C4 Picasso, with CO2 emissions of between 125g/km and 132gkm. These figures can represent up to a 15% benefit for both emissions and economy. Both ranges also now get a new 2.0 HDi 150hp diesel engine with a six-speed manual gearbox, which does an average 49.6mpg. A 2.0HDi 160hp with a six-speed automatic gearbox will also be available for the first time on Exclusive models. The new cars hit the showroom in October, with prices starting at 16,345 and rising to 24,595.